The election result in Osogbo, the most populous local government area of Osun State, will determine the results of the governorship election in the state, PREMIUM TIMES has reported. Based on the results collated from 29 INEC local government secretariats as well as the INEC headquarters in Osogbo, the PDP has a lead of just over 12,000 votes ahead of its closest rival, APC. The collated results, many of which have been further verified by INEC at its headquarters in Osogbo as at the time of this report, show that the PDP has so far scored about 236,784 votes, while the APC has scored about 224,488 votes. 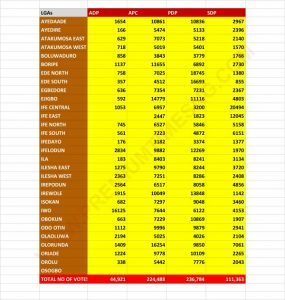 While the PDP leads in total votes cast so far in the 29 local governments, in terms of number of local governments, the APC has the lead. The governing party has so far won in 15 local governments, while the PDP has won in 11 local governments. 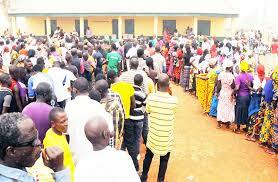 The ADP has won in one local government (Iwo) while the SDP has won in two local governments (Ife East and Ife Central). Osogbo, the Osun State capital, had over 53,000 valid votes cast in the 2014 governorship election with the APC winning about 75 per cent of valid votes. Results that have come in from some wards and polling units in Osogbo show the governing party is leading in the local government. 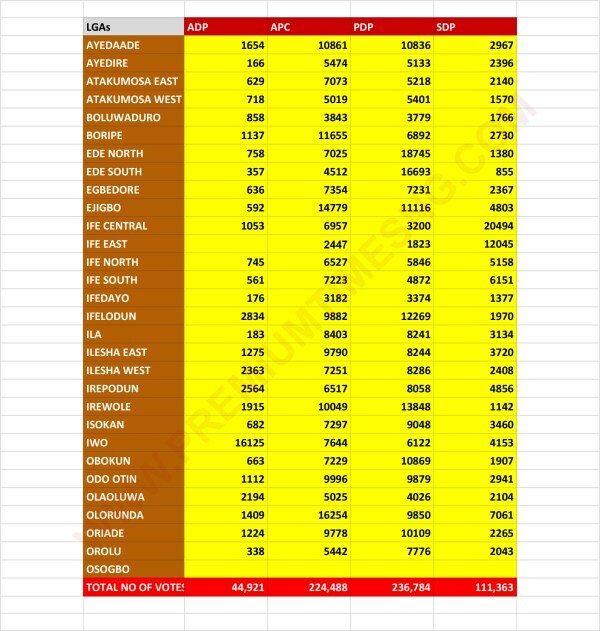 However, only the final results from the local government will show if the APC can overcome the over 12,000 votes with which it is trailing the PDP.